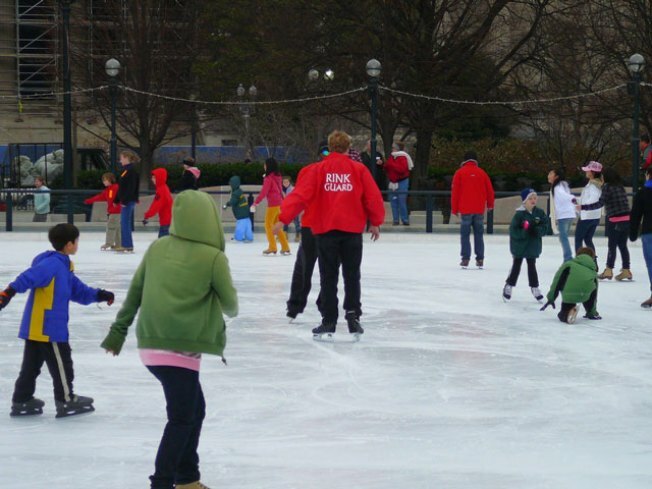 Ice skating on the National Mall starts today! It’s a classic sign of the holiday season in our region and its open today! The Ice Rink at the National Gallery of Art’s Sculpture Garden is kicking off their skating season this morning. More than 65,000 people strapped on skates last year to enjoy the beautiful outdoor rink. And some of the first visitors this year will enjoy a freebie. Anyone who skates on Saturday or Sunday this weekend will get a coupon for a free cup of hot chocolate. Check out the rink hours so you can enjoy this Washington landmark. It will be open until March 11 as long as it stays cold enough. -	Monday-Thursday: 10:00 a.m. to 9:00 p.m.
-	Sunday: 11:00 a.m.-9 p.m.